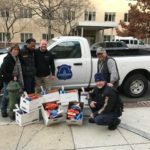 Code 3 Association partnered with McLean Bible Church to provide coats to underprivileged children at Hutchison Elementary School in Herndon, VA. Our participation came as a result of the relationship we have built between the school, community, and police in Herndon. Police officers were present at the event, speaking with families and handing out coats. 300 warm winter coats were given to children who otherwise would not have them. 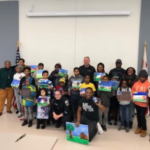 This event successfully brought together police officers and the community they serve!